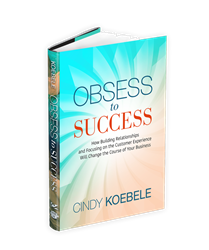 Cindy Koebele, President of TitleSmart, Inc., has announced the release date of her upcoming book: Obsess to Success on September 1st, 2018. This will be the third book authored by Cindy Koebele. Cindy has also published two children’s books based on her beloved beagle: Puppa-na-wuppana, The Beagle with the Magical Nose and Living the Puppa-na-Life. Obsess to Success marks Cindy’s first business book. Obsess to Success will be for sale at CindyKoebele.com as well as on Amazon (including an audio book through Audible), Barnes and Noble and other various retailers. In Obsess to Success, Cindy shares how she was able to build her success on a foundation of personal relationships. She shares personal experiences to highlight how building relationships and focusing on the customer experience has helped to create the bedrock of her successful Title Insurance company. Readers will be able to take away simple, practical tips and suggestions on how they can create memorable experiences with those around them, helping to cement relationships with clients, vendors, and staff members. Cindy Koebele started TitleSmart, Inc. in 2007, during the collapse of the housing bubble. Her intense focus on creating a positive customer experience turned TitleSmart into one of the Inc. 5000 Fastest-Growing Private Companies in America in 2014, 2015, 2016, and 2017. Employees and colleagues alike count on Cindy’s frankness and generous nature. A born observer of people, her curiosity contributes to her ability to find common ground with almost anyone. In June 2015, Cindy was named Ernst & Young Entrepreneur of the Year for the Upper Midwest, further cementing her status as a powerhouse leader and entrepreneur. Cindy was the only female to be named Entrepreneur of the Year in her category in 2015. She also serves as the President of the Board of Directors for Spare Key, a nonprofit that provides housing grants to make a mortgage payment for families with seriously ill or critically injured children.